I learned how to make apple cinnamon cheesecake recipe although it is not as popular as some of the other cheesecake recipes but do not be deceived. The taste of creamy cheese with apples is a flavor not to be overlooked. Even when I take a break to have a piece of apple for a snack I almost always have a small piece of cheese with it. It is a great combination! When you learn how to make apple cinnamon cheesecake recipe, you will know when adding the cinnamon to the recipe you must ask “how can it get any better”? This spice is a natural for apple recipes. Nutmeg is another spice which is often used in apple recipes; most of the time pairing up with cinnamon. These two work well together. I have been told when I learned how to make apple cinnamon cheesecake recipes it was created in England. That may well be but I would not be surprised if it didn’t originate here in the United States. We grow so many apples; all my life we were able to eat apples when we did not have any other fruit; We could only make strawberry recipes a very brief period in spring from our berry patch. Not only do we grow apples in abundance but they do stay good for a long time. This means we could pick the apples in the fall and when stored properly we would have the fruit for a large part of the year. I am sure with the abundant supply of fresh apples throughout most of the states and the passion for a creamy cheesecake, this apple cinnamon cheesecake recipe very well could have been created here. Also convincing me of this theory is the fact that all my recipes are made with cream cheese rather than ricotta recipes or other types of cheese. This is truly an American way of making these delicious recipes. APPLE PECAN CHEESECAKE RECIPE apple cinnamon cheesecake recipe is extra special with the pecan and rum flavor. Beat butter until creamy; add ground pecans, ¼ cup sugar and rum and beat until combined. Add 1 cup flour and knead until blended. Roll dough between 2 sheets of waxed paper to 10 inch circle. Remove paper and fit into 9 inch spring form pan; press pastry down and around sides of pan. Cover and chill while preparing filling. For filling beat cream cheese, 2/3 cup sugar, eggs and vanilla until smooth; pour into chilled crust. For topping combine brown sugar, 1 tablespoon flour and cinnamon in a large bowl. Add apples and toss lightly to coat. 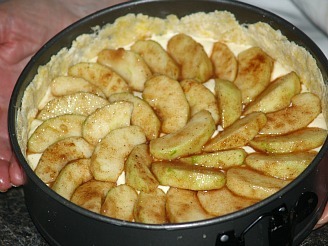 Arrange apples in circular pattern over cheesecake filling. 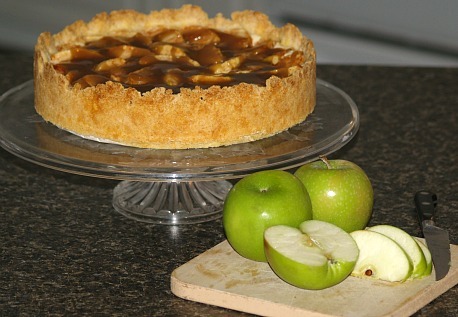 Bake for 25 to 30 minutes longer or until apples are tender and cheesecake is set. Sprinkle with chopped pecans 5 minutes before cheesecake is done. Cool to room temperature, remove rim and refrigerate. This apple cinnamon cheesecake recipe gives a fresh cinnamon flavor from the cinnamon sticks in the boiling mixture. Blend cream cheese with cream; spread over bottom of pie crust. Peel apples and cut into eights. Place 1 ½ cups water and sugar in saucepan and bring to a boil. Drop apples and cinnamon stick into boiling mixture; simmer until apples are tender but not broken. Drain and let apples cool; discard cinnamon and reserve 1 ¼ cups of hot syrup. Add lemon rind and lemon juice to reserved apple syrup. Mix cornstarch with remaining 2 tablespoons water; stir into apple syrup mixture. Bring mixture to a boil stirring constantly over low heat cooking for 2 minutes. Add a drop of red coloring to make light pink mixture. Arrange apples nicely in pie shell; spoon glaze over the apples. Serve at room temperature; garnish with whipped cream. This apple cinnamon cheesecake recipe is a little different from the others because it has applesauce mixed in the filling. Blend in eggs one at a time beating well after each addition. Add applesauce, cinnamon and nutmeg; beat well. Divide evenly into 2 pie shells; bake for 50 to 60 minutes or until center is set. Remove from oven and cool; refrigerate until ready to serve. 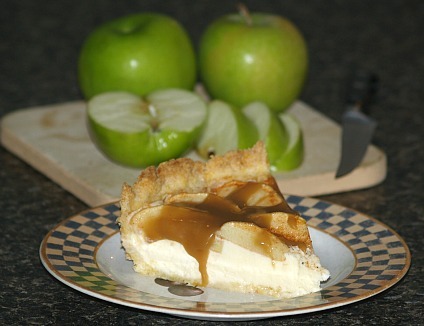 The easy caramel sauce recipe is a great topper for this apple cinnamon cheesecake recipe. Preheat oven to 375F degrees; lightly grease 9 inch spring form pan. Sift both flours into large bowl; stir in the sugar. Cut butter into mixture with pastry cutter until resembles coarse meal. Add egg yolks and mix with hands until dough forms; press into bottom and 2 inches up sides of pan. Prick bottom and sides lightly with fork; refrigerate until ready to use. Beat sugar and cream cheese together until fluffy; add eggs one at a time blending after each. Add vanilla and beat on medium speed until smooth; spread over chilled crust. Mix sugar, cinnamon and nutmeg together; sprinkle over apples and toss to coat. Arrange apples over filling; bake 60 to 65 minutes or until apples are tender and filling is set. Remove from oven and cool to room temperature; cover and chill overnight. Garnish with whipped cream and chopped nuts. Melt butter in medium saucepan; stir in brown sugar and corn syrup. Bring mixture to a boil stirring constantly until sugar dissolves about 1 minute. Slowly stir in the whipping cream and return to boil; immediately remove from heat. Cool to warm and serve. This apple cinnamon cheesecake recipe is baked in a tart pan. Combine all ingredients with pastry blender or pastry cutter. Roll pastry to 1/8 inch thickness on floured surface and fit into 7 ½ inch round tart pan. Trim off excess dough and freeze for 10 minutes; line pastry with foil and fill with pie weights. Bake in preheated oven at 400F degrees for 10 minutes. Remove weights and foil and prick bottom with fork; bake additional 10 minutes. Cool on wire rack (pastry will shrink). Combine cream cheese, sour cream, egg yolk, honey and lemon rind; beat until smooth. Spoon mixture into tart shell and arrange apple slices on top. Combine apple jelly and water in a small saucepan; cook over low stirring constantly until jelly melts. Brush half of mixture over apples. Bake in preheated oven at 400F degrees on lower oven rack for 35 minutes; cool on wire rack for 15 minutes. Brush with remaining jelly mixture; cool completely. Beat whipping cream on medium to soft peaks; beat in honey and vanilla and serve with tart. Learn how to make apple cinnamon cheesecake recipe with applesauce and a cheesecake mix. TO MAKE CRUST empty envelope of graham cracker crumbs from cheesecake mix into a bowl. Add sugar and melted butter to the bowl; mix until thoroughly combined. Press mixture firmly in bottom and up sides of 8 inch spring form pan; refrigerate 10 minutes. TO MAKE FILLING pour milk into a small mixing bowl; add envelope of filling from package. Add applesauce and grated lemon peel; beat on low speed of mixer until blended. Increase speed to medium and beat 3 minutes longer; pour into prepared crust. Chill cheesecake at least 1 hour. TO MAKE TOPPING combine applesauce and remaining ingredients in saucepan. Heat over medium and simmer for 20 minutes. TO SERVE remove sides of pan and cut into slices; spoon over topping (Warm or cold). Learn how to make apple cinnamon cheesecake recipe with gingersnap crust flavored with caramel and spices. Spray with vegetable spray 9 inch removable bottom tart pan. TO MAKE CRUST combine crumbs, pecans, butter and brown sugar; blend well. Press crust mixture on bottom and sides of prepared pan. Place pan of baking tray in oven; bake 10 minutes and cool. TO MAKE FILLING beat cream cheese and sugar until creamy. Add egg and apple pie spice; beat until smooth and well blended. Spoon mixture into prepared crust; bake until center is set about 20 to 25 minutes. Remove to rack and cool completely; chill 8 to 12 hours. TO MAKE TOPPING stir together in bowl the apples and brown sugar. Melt butter in skillet over medium heat; add apple mixture. Stir and cook 16 to 18 minutes until apples are tender; set off to cool. Arrange apples on top of cheesecake. Melt jelly and water together; brush apples with half of jelly mixture. TO SERVE brush remaining half of jelly mixture again over apples. Sprinkle top with cinnamon; remove sides of tart pan and serve.